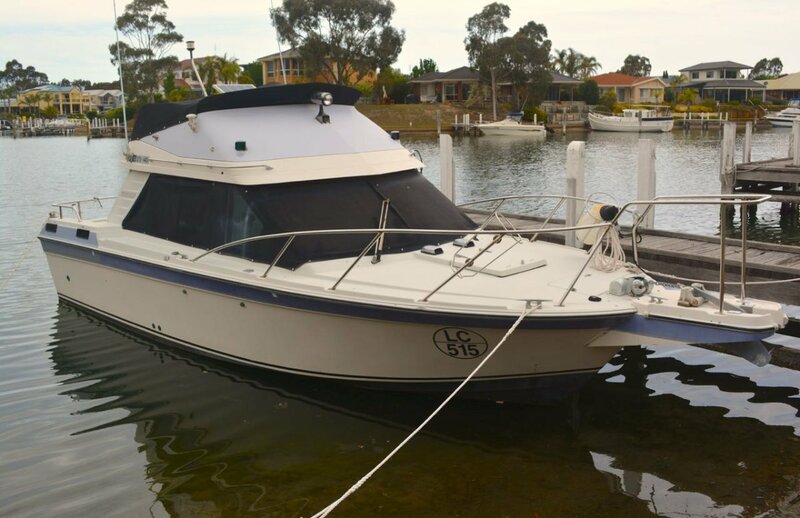 Presented in very good, well maintained condition, this Yamaha 25SR Flybridge Cruiser was in launched 1990 and is fitted with twin Volvo 150hp 4 cylinder FWC petrol motors which give sprightly but economical performance. The layout features a spacious open plan interior with a large double berth in the bow, internal steering to starboard and a dinette to port which converts effortlessly to twin forward facing seats. Opposite is the galley and fully enclosed electric head with recently fitted holding tank. Large rear flat floor cockpit gives easy access to the engine bay and also the flybridge. Inventory includes bow-thruster, Raymarine GPS, VHF Radio, 12v Fridge, cold pressure water, flybridge tonneau, and bimini. A very comfortable open plan cruiser. Both motors have been overhauled and serviced along with the legs.